SNITZEL (AUS) (Bay 2002-Stud 2006). 7 wins-4 at 2, MRC Oakleigh P., Gr.1. Champion Aust. Sire twice. Sire of 970 rnrs, 722 wnrs, 89 SW, inc. Trapeze Artist (ATC TJ Smith S., Gr.1), Shamus Award, Estijaab, Redzel, Summer Passage, Invader, Russian Revolution, Hot Snitzel, Sweet Idea, Sizzling, Snitzerland, Wandjina, Heavenly Blue, I Am Excited, Spill the Beans, Menari, Showtime, Snitty Kitty, Thronum, French Emotion, Time for War, etc. RADIANT ANGEL, by Kheleyf. 6 wins-1 at 2-at 1000m, 1250m, A$81,865, BRC Sequalo at Lyndhurst H., 3d ATC Australian Turf Club H. Half-sister to Scratch Me Lucky. This is her second foal. Her first foal is a 2YO. Radiant Angel. 6 wins. See above. Rexx. Winner at 1600m in 2018-19, 2d ATC Rise Up at The Championships H., 3d ATC ANZ Bloodstock News H., Summer Night Racing H.
Astrological. 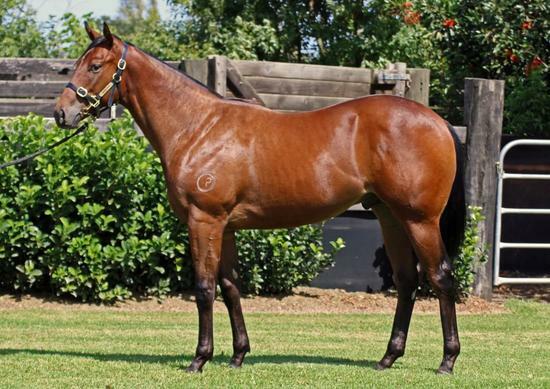 3 wins at 1200m, A$85,595, to 2018-19 in Aust. Akasaki. 8 wins-1 at 2-to 1100m, A$303,085, to 2017-18, ATC TAB H., Theraces H., Scone RC Vinery Stud H., 2d ATC Sydney's West App H., Theraces H., Turf Club H., 3d ATC Davali Thoroughbreds Cup H., Owner Benefits Card H., 4th Hawkesbury RC Gold Rush H., L.
Double Jeopardy (Exceed and Excel). 2 wins at 1000m, 1200m, A$191,115, in 2017-18, VRC Ron Taylor H., 2d VRC Maribyrnong Trial S., L, Perth Racing Tourism WA Trophy H., 3d VRC Great Ocean Road H.
Royal Scandal. 4 wins to 1300m, A$112,405, MVRC Sportingbet H., 2d MVRC Boscastle H., SAJC Irish Race Day H., Pro Paint' n Panel H.
Imperial Edition. 2 wins at 2000m, 2100m to 2018-19, 3d MRC (Mornington) Jack Dow Memorial H.
Kalabek. 2 wins-1 at 2-at 1000m, A$101,690, MRC JRA 2YO H., The Cove Hotel H.
ROYAL HAUNT - MIRAGE (H.K.) (Hard Spun). 5 wins to 1400m, A$235,810, HK$1,548,000, MRC Manfred S., L, ATC TAB Rewards H., HKJC Lion City H., 3d Warrnambool RC Wangoom H., L, 4th MRC Italktravel S., L.